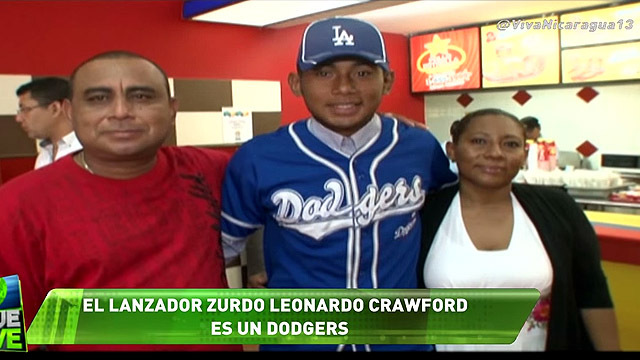 A hidden gem in Nicaragua two years ago, left-hander Leonardo Crawford has quickly proven Dodgers scouts right. The 18-year-old combined with two relievers on a no-hitter Thursday in just his third career Minor League outing as Los Angeles' Rookie-level Dominican Summer League affiliate blanked the DSL Mets, 7-0. Crawford (3-0) struck out nine and walked one over 6 1/3 innings before Wally Vrolijk and Johan Diaz worked the final 2 2/3 innings to seal the no-no. The southpaw from Puerto Cabezas has allowed just five hits in 17 1/3 scoreless innings since his Dodgers debut on May 30. Vrolijk struck out two in 1 2/3 frames before Diaz worked around a walk in the ninth to finish the no-hitter. Jimy Perez and Felix Osorio homered in the fourth for the Dodgers. The Dodgers inked Crawford as one of their international free agents last year. Although the organization reportedly had a deal in place with the young lefty in May 2013, the signing wasn't announced until last July on the first day of the 2014-15 international signing period. He received a $47,500 bonus, a small portion of the Dodgers' allotted bonus pool total of $1,963,800. The 6-foot, 180-pound lefty allowed two hits over five innings in his Dodgers debut on May 30 before striking out six and limiting the DSL Mariners to three hits and a walk over six frames on June 5. He's struck out 19 batters in 17 1/3 frames. The DSL Dodgers' gem Thursday is the first no-hitter in the Dominican Summer League since former Yankees prospect Rafael De Paula threw a rain-shortened five-inning no-no on Aug. 7, 2012.